The Dharma bicycle is generally considered the Ordinary style of bicycle in Japan. The adoption of this name originated because it resembles in the form that laid. Dharma. It is, needless to say, the highly reputed monk who prepared the foundation of Chinese Zen sect. He was born in India and reached China by sea route in the year 470. He studied in the Mount Songshan Shao-ling temple. The figure called Dharma shows the form how he meditated. After that, people believed that this figure make a happy charm. The Japanese feel familiarity to this Dharma, and sign of exceptional good luck. This is a quote from a wonderful extensive page about the history of the Bicylce in Japan. With many pictures. Let us read a little more from this essay. Documented information on high wheel bicycles in Japan is extremely scarce. It is quite incomplete and seems quite impossible to prove when the first ordinary appeared in Japan. However it is my life long plan and desire to find out the record. Here are my reports of discoveries at the time being. Few undated photographs of high wheelers show a proud Japanese participation in the high wheel bicycle era. Actual examples of these bicycles that exist in Japanese museums and a few private collections show a history of both import and domestic blacksmith shop production. The early Ordinaries produced by Japanese blacksmiths locally are apparently at the same step with the world trend of the 1880's.You can tell it form early woodblock prints. Judging from the information with dates, one can conclude that the high wheel period in Japan had a span of a decade from 1885 to 1895. Further information may be discovered by bicycle historians of the other parts of the world. It may come, for example, in the form of an old invoice from London, or, San Francisco showing the shipment of an ordinary to Japan. It may say in a ship's cargo manifest. Other sources like export and customs documents from the West could easily help pinpoint date of early high wheel shipments to Japan. These, along with many other documented materials could help significantly to my search. Ordinary Style Bicycles Still in Existence. In March of 1978, the Meiji bicycle exhibition was held in the bicycle culture center located in Tokyo, Akasaka. The fine display of bicycles exhibited here, were from all over Japan. Even rare bicycles that there was not previously available for viewing were on display. 13 ordinaries were displayed, area backgrounds and places of production were discussed. There was another link describing this Daruma Bicycle. Around this time, the diameter of bicycle front wheels started to get gradually larger and larger. The reason for this was the larger the front wheel, the farther the bicycle travels with each wheel revolution, thereby producing higher speeds. Another name for this model was a penny-farthing because it resembled the English penny and farthing (one-quarter pence) placed next to each other. Ordinary bicycles had straight handlebars and wooden rims and spokes. 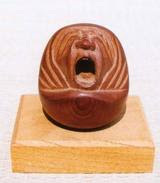 In Japan, they were called "Daruma jitensha" or "ichirinsha." This new form of bicycle required advanced riding technique. 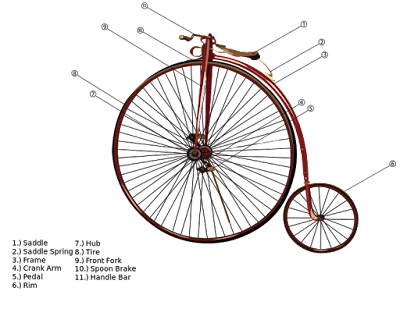 The penny-farthing, also known as a high wheel, high wheeler and ordinary, is a type of bicycle with a large front wheel and a much smaller rear wheel. 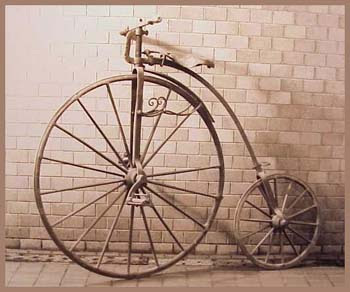 It was popular after the boneshaker until the development of the safety bicycle in the 1880s. It was the first machine to be called a "bicycle". Although the name "penny-farthing" is now the most common, it was probably not used until the machines were nearly outdated; the first recorded print reference is from 1891 in Bicycling News. It comes from the British penny and farthing coins, one much larger than the other, so that the side view resembles a penny leading a farthing. For most of their reign, they were simply known as "bicycles". In the late 1890s, the name "ordinary" began to be used, to distinguish them from the emerging safety bicycles; this term and "hi-wheel" (and variants) are preferred by many modern enthusiasts.